of a comic strip of the early 20th century, For This We Have Daughters, by Cliff Sterrett (Polly & Her Pals). It was a domestic comedy about an ordinary man dealing with a family member who is alien in both generation and gender. Vermeer had been working as a sports cartoonist for Newspaper Enterprise Association (the syndicate that distributed Captain Easy, Red Ryder, Our Boarding House and many others) when he launched Priscilla's Pop through that syndicate on Sunday, July 7, 1946. The daily version began April 28 of the following year. 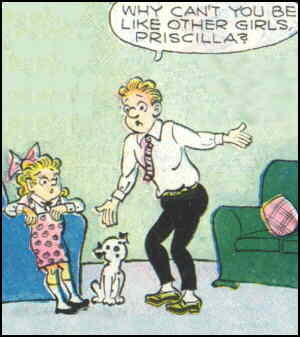 "Pop" was Waldo Nutchell, who, with his wife Hazel, headed up a family of two parents, two children and a dog. The son (late pre-adolescent) was Carlyle. The dog (small and of no particular breed) was Oliver. And the young school-age daughter was, of course, Priscilla. She was, in every possible way, a perfectly normal kid, outrageous only to the extent that most people that age are outrageous. It was only Waldo who got exasperated trying to deal with her. The cast was rounded out by Priscilla's friend, Hollyhock (who liked to read and consequently had a lot of general knowledge swimming around in her head), and Hollyhock's nemesis, Stuart (who doubted most of the factoids Hollyhock expressed). Between 1954 and '57, Dell Comics devoted four issues of its Four Color Comics (a catch-all series that also ran television adaptations like Winky Dink, other newspaper comics like King of the Royal Mounted and lots more) to Priscilla's Pop. Other than that, it pretty much stayed on the newspaper page, a reliable but unremarkable laugh getter. Tho it made no noticeable forays into movies, TV or merchandising, it lasted decades. Vermeer retired in 1976, and died in 1980. The strip was taken over by Ed Sullivan, who had previously been handling Out Our Way, another NEA offering. It ended in 1983. Text ©2005-07 Donald D. Markstein. Art © Newspaper Enterprise Association.